After 2 years or so of putting up with difficult personalities at RavenMUD, Bathala* and myself are spearheading the transition of all Coven players to a realm which we finally can call our own. Though bitter sweet, it is a move necessary to put into motion the changes that are needed to restore the near lost art of mudding, for Filipinos. When we started, there were probably around 20 Filipino players, more than enough to form a merry company in our adventures. The entry of MMORPGS’s however was the beginning of the end. Further through the years we lost players not just to MMORPG’s but also to real life commitments. The bleak reality of the end for mudding. So is mudding a lost art? Pretty grim picture. Will it ever pick up in the near future? A high probability of no, unless we do something about it. So we really are just a couple of bored people with a passion for mudding, looking for a new home with the skillsets to get something going and the vision to share the gaming experience to anyone willing. Bathala is taking the lead on development and we are building everything from the ground up. 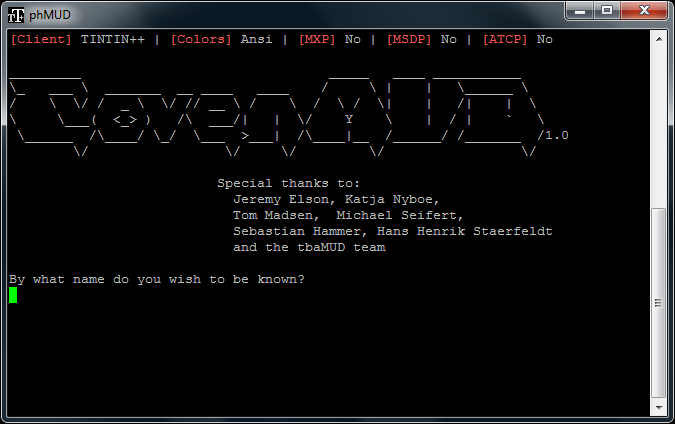 The idea is to put up a Filipino MUD server and provide them a game experience that they will truly enjoy. Solo adventure, group runs, quests, tournaments, specialized skills, races, clans, culturally Filipino inspired areas and the whole lot of everything.